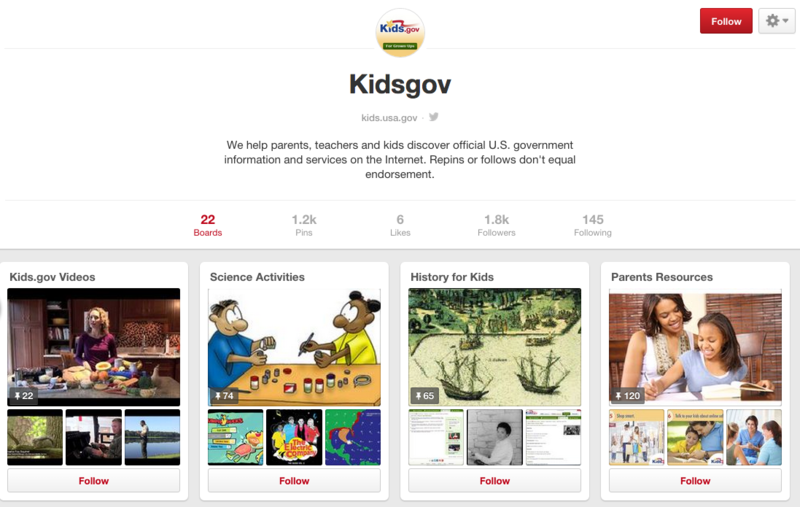 Last summer, Kids.Gov revamped its presence on Pinterest in an attempt to find new ways to connect with its followers. The Marketing Team set out to learn more about our audiences and the kind of content they like. Despite being a difficult platform to navigate, we set lofty goals for ourselves and developed a timely strategy to pin everyday. Twelve months later, our metrics are up and we correctly calculated that a shift to educational content would be key. However, Pinterest is still a challenge to predict. Unlike Twitter and Facebook, it’s difficult to identify trends. Despite all that, we have seen substantial growth in followers and content consumption, even taking into account our ambitious goals. Unlike other platforms all the action takes place at night, peaking around 9 PM. Our primary audience (teachers) takes the summer off. Infographics are more popular than on other platforms. Vertical images perform much better than horizontal ones. Health, history, and money related topics perform the best. Posts have a longer lifespan compared to Twitter and Facebook. Our hope moving forward is to learn more about the Pinterest audience and begin to predict certain topics and when they will be popular. Pinterest is still a challenge to our marketing team, but one we gladly approach and look forward to understanding. Edgardo Morales and Phat Nguyen are members of the USAGov Marketing Team.